I think we might just have the next big Disney movie idea. 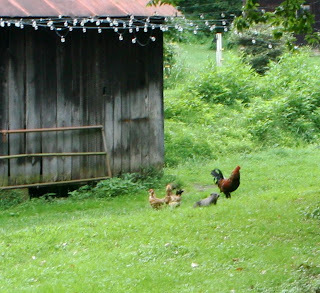 The story of a groundhog and the rooster that loves him. At Cookbook Of The Day, we featured The Vermont Farm Table Cookbook by Tracey Medeiros and picked a recipe for New York Strip Steaks with WhistlePig Whiskey Demi-glace Sauce. We thought of our own whistle pig. Here he is sashaying with the chickens. Not the best picture as he is rather camera shy. Fine, it is not the camera he is afraid of but my gun, as I have tried on more than one occasion to do him in. Still, he bears no animosity and visits most days, staying close to his burrow and out of range of my gun and my camera. They really do whistle. In the late evening, he will stand up on his hind legs and give us a whistle.